When I walked into the boardroom I knew something was seriously off key here. The new CEO was sitting with his back to his team. Some leaders were juggling with their phones, others were answering emails. This was supposed to be a breakthrough meeting about the strategy for the coming two years. It was one of their biggest challenges yet. What was going on? The need for intuition is increasing as we are faced with more situations where there is a high level of uncertainty, with little precedent. Facts are unavailable or unreliable and the timeframe to act is limited or scarce. Intuition is part of the looping process and it entails forming a circuit of intuitive sensing and data collection – aggregating many touch points. The intuitive nature of looping is important when trying to anticipate the future and make good business decisions. So how do we make rapid, viable decisions in this increasing turbulence? It pays to have good intuition: successful executives score far above average on extrasensory perception tests. There is a significant correlation between these precognitive abilities and profit ratings of their companies (Mihalasky & Dean, Agor 1986). Many people feel their intuition is lacking or they can’t rely on it. In The Nature of Intuition Berne identified that the chief requisite for accurate intuition is an active and concentrated state of alertness and receptiveness. With practice intuitive mood can be attained more easily and the accuracy of intuition increases with accumulated experience. Some people are better at being intuitive: experts are better at recall and recognition than novices because they acquire habits that help them process information more quickly e.g. chunking information more efficiently. Experts also use different problem solving strategies; they take in details then create a framework that best fits the data they have and then they work forwards to explore possible solutions. Novices, on the other hand, identify specific solutions and work backwards to find a way to reach that solution. The skill of recall involves recognizing patterns, and this is easier for experts because they already know a lot about the context in which the object of recall is embedded. For example, when I walk into a new organisation I look at the way employees and managers interact, and can already see patterns emerging. Recognition is based on noticing similarity. To determine if two things are similar you must know which features to consider. Recognition is easier for experts because they limit the complexity of what they observe to salient points. For example I use an easy way to recognize patterns of communication: Are they close or distant? Do they talk from a dominant or submissive position? Women are better at intuition than men due to their greater empathic accuracy and nonverbal skills. This is partly evolutionary as differentially selected as primary caregivers for their ability to decipher nonverbal cues. Women developed their intuition in part as a minority group to observe how others acted before taking action themselves, and to be adaptable to circumstances. Improving your intuition can help you and your team make better, faster decisions. Select or create a good learning environment, that is relevant and exacting. How are you providing the right environment for yourself and your team? Seek feedback actively and systematically. What is your process for eliciting feedback? Have you systemsied it? Impose circuit breakers, become mindful of automatic reactions. How do you avoid jumping to conclusions or making 2+2 equal 5? Make scientific method intuitive: observe better, speculate consciously about what you see, test ideas, generalize carefully. What process do you have for testing ideas? How are you taking the learning back into the team? 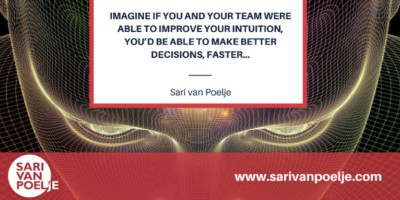 It pays to have good intuition – how are you training yourself and your team to develop your intuitive skills?